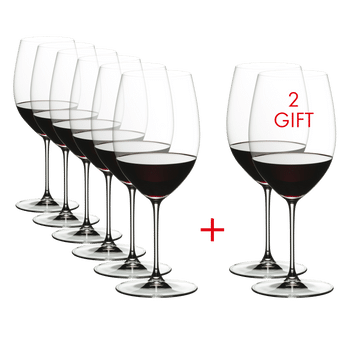 The diamond-shaped machine-made Syrah and Shiraz glass of the eye-catching glass collection Vinum Extreme is offered in an attractive value gift pack - Pay 4 Get 6. Ideal to give as gift or to enjoy yourself. It is shaped to deliver the classic Syrah aromas of toast and black olives. On the palate, it brings out the wine's silky, velvety structure and balanced flavours. The tannins melt into the fruit, appearing sweet rather than acerbic on the back palate. A very specific glass was required to showcase and highlight the special qualities presented in the more perfect wines from the New World. All RIEDEL glasses are dishwasher safe.